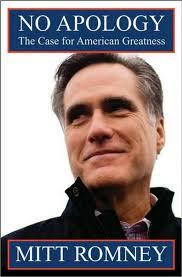 This book, published in 2010, outlines Mitt Romney's case against Obama for the 2012 election. Its title makes Romney's case that Obama is an apologist for America (pp.24-33) whereas Romney would instead "proudly defend her." If the title sounds arrogant, that too is Romney's intent: he claims that Obama is too weak in missile defense (p. 18); in defense spending (p. 31); in the War on Terror (p. 64); and in just about everything. While this book focuses heavily on foreign policy and military issues, Romney also makes the domestic case against Obama. Romney reinforces his conservative credentials against abortion (p. 265) and against gay marriage (p. 269), since those credentials need substantial reinforcement in the view of many hard-line conservatives (Romney ran against Ted Kennedy for the Massachusetts Senate seat in 1994 as a pro-gay, pro-choice Republican). But mostly Romney focuses on healthcare. And mostly he focuses on how RomneyCare (the Massachusetts healthcare plan initiated by Romney as Governor) is not the same as ObamaCare (p. 176). Mostly Romney's opponents will focus on how ObamaCare is based heavily on RomneyCare: the 2012 Republican primary voters will have to decide which view prevails. On the question of whether Romney is running in 2012, this book answers unambiguously "Yes." Romney never actually SAYS that, of course. But candidates never do. The book's purpose is to establish Romney as sharing core conservative values, which he will need to win the primary election. And the book's other purpose is to establish Romney's line of attack against Obama, which he will need to win the general election. In summary, this book outlines Romney's campaign plans for 2012. Mitt Romney: Abortion decision should recognize TWO lives involved. Mitt Romney: Our lack of vision led to financial collapse & loss of $12T. Mitt Romney: Strong economy makes superior defense AND citizen prosperity. Mitt Romney: US didn't bail out Wall St.; we prevented financial failure. Mitt Romney: Marriage is not just quaint custom; recognize critical role. Mitt Romney: Corporations won't send jobs overseas if tax rates lowered. Mitt Romney: Hire private companies to manage our state prisons. Mitt Romney: China & India graduate more science & engineering PhDs. Mitt Romney: Failure to educate minorities is a civil rights issue. Mitt Romney: 2003: Bold reforms: required H.S. graduation test. Mitt Romney: Teachers' union has deadening impact on student achievement. Mitt Romney: Vetoed abandoning three new Massachusetts charter schools. Mitt Romney: Climate change is occurring, with SOME human contribution. Mitt Romney: No-regrets policy at home; reduce greenhouse emission abroad. Mitt Romney: Nuclear power is a win-win: no CO2 and no imports. Mitt Romney: The Worst Generation precludes children from American Dream. Barack Obama: OpEd: American Apology Tour: disliking USA understandable. Barack Obama: OpEd: overseeing smooth decline into post-superpower status. Colin Powell: We do not seek conquest or colonies. Mitt Romney: In long term, Chinese reforms lead to demanding freedom. Mitt Romney: Post-WWII role: defeat threats to progress of freedom. Mitt Romney: American Exceptionalism means America need not decline. Mitt Romney: Different countries' paths to decline came from isolation. Mitt Romney: National turnaround requires leadership; consensus; strength. Mitt Romney: Trade is good for the nation, but not good for everybody. Mitt Romney: Protectionism stifles productivity, under Bush AND Obama. Mitt Romney: Dynamic regulations: forward-looking & consistently applied. Mitt Romney: 1960s large donors avoided union influence in politics. Mitt Romney: Measure American success by series of cyclical indicators. George W. Bush: AIDS Relief: largest int'l health initiative in history. Mitt Romney: 2006 lessons: involve everyone; demonize none; transparency. Mitt Romney: People without insurance already receive care via E.R. Mitt Romney: 2006: Compromise with Ted Kennedy to make RomneyCare reality. Ted Kennedy: 2006: Supported RomneyCare as model for other states. Tommy Thompson: Proposed block grants to states for all of Medicaid. Barack Obama: OpEd: walked away from missile defense of Eastern Europe. Bill Clinton: Shrank military by 400,000 troops during 1990s. Mitt Romney: Increase defense spending to at least 4% of GDP. Mitt Romney: Recognize the scope and reality of the jihadist threat. Mitt Romney: Strengthen soft power because it is real power. Mitt Romney: China's military is over half our size (not one-tenth!). Mitt Romney: Defense cost comparison US vs PRC. Mitt Romney: Our nuclear arsenal must be updated comprehensively. Mitt Romney: Allies must increase defense spending to a fair share. Mitt Romney: Strong Economy; Strong Military; Strong People. Mitt Romney: Immigration practices are upside down: more hi-tech visas. Mitt Romney: Ardent proponent of English immersion. Mitt Romney: "Card check" is a massive imposition on worker freedom. Mitt Romney: Incentivize hiring jobless: cover $2000 in training costs. Mitt Romney: Opposes "25-75": 25 years of service then 75% pension. Mitt Romney: Hard times made us the people we are today. Mitt Romney: President should proudly defend US, not apologize for her. Mitt Romney: America is freedom and freedom must be strong. Mitt Romney: So-called "Trust Fund" has defrauded American people. Mitt Romney: Add individual retirement accounts as option. Mitt Romney: Eliminate taxes on dividends & interest but not via FairTax. Mitt Romney: Two-part innovation: improve the old; invent the new. Mitt Romney: National R&D spending OK; picking winners not OK.
Mitt Romney: American resolve in Iraq counters jihad with fortitude. Mitt Romney: Entitlements: focus on future beyond next election.